Shopping cart software platforms also known as eCommerce solutions, are designed to help merchants sell their products online. Basically, it is shopping cart software that creates online stores. They, however, come in different forms but most allow users to build their own websites from scratch or simply add a store tab to a pre-built site. One such tool is WooCommerce, a platform designed to make online stores out of websites that are powered by WordPress. 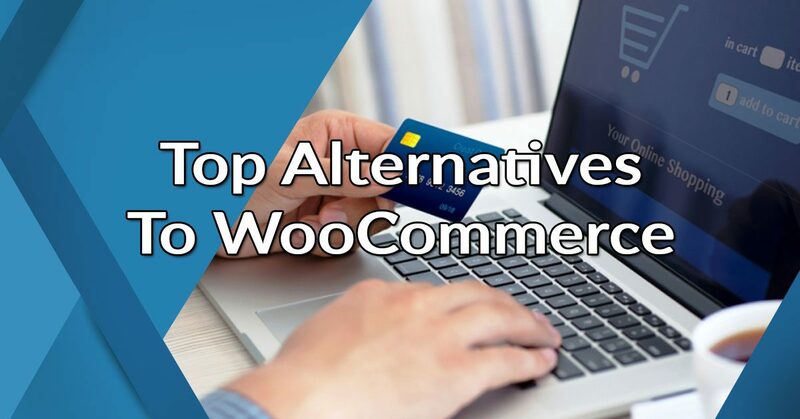 In this article, we will take a look at the top 10 alternatives to WooCommerce as determined by our experts. Tool features, pricing, and key selling points will be discussed in detail. What are the top 10 alternatives to WooCommerce? Every online seller makes money from having site visitors, the more visitors they have, the more chances of making a sale. This is why website design plays a major role in their bottom lines as attractive websites tend to make customers stay a while longer, therefore increasing the likelihood of a purchase. However, there is a website component that maybe often taken for granted yet is equally as important than the site itself–shopping carts. But whatever form they take, these tools basically do the same things. They allow users to add images, product info, prices and tax and shipping data to the system, with each product added displayed in the store. This enables online shoppers to browse the site, choose their preferred products and checkout their purchases all from the seller’s site. Truly, shopping cart tools have with them the essentials for eCommerce success. While the use of the tools has become popular, there are other trends that determine the future of eCommerce. One of the most popular among such platforms is WooCommerce. This robust eCommerce tool is designed to make great looking online stores out of any Wordpress website. The solution has an enterprise-grade eCommerce plugin, which allows anyone to create an online store or make one from an existing WordPress site or blog. The plugin basically comes for free. However, updates and upgrades can be purchased by those who want more advanced features and functionalities. A free eCommerce plugin. WooCommerce is essentially an eCommerce plugin that comes absolutely for free. As simple as it is, the solution sports a myriad of features and tools that are needed to start selling online. Intuitive dashboards. The product is easy-to-use owing to its intuitive interfaces, which make online store setup fast and easy. It can be setup in a matter of minutes as the system comes with an onboarding wizard that will guide you through the entire process. Open-source solution. The product is fully open-sourced so that anyone can view, make modifications and even contribute to making the system even better. This also promotes the idea of having an active community of people who want to contribute to the project. Library of extensions. WooCommerce has a vast array of add-ons, which include shipping and tax calculators, subscription and membership system management, payment gateways and anti-fraud tools, to name a few. It is also supported by a vast collection of extensions developed by the community. Robust support. 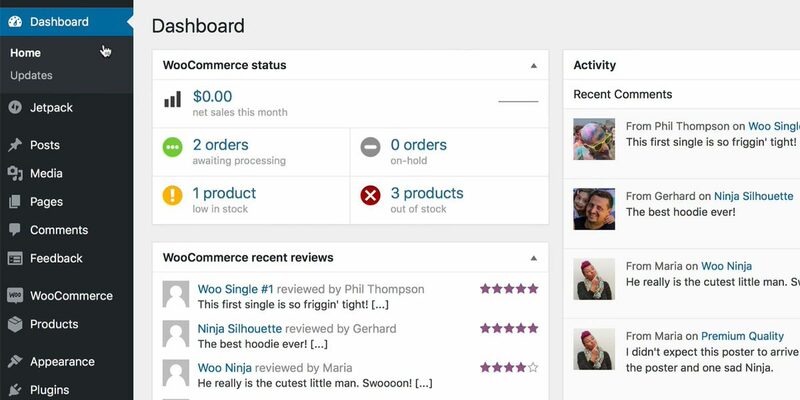 Users get to enjoy the full support of user communities, software experts, business owners, apart from the WooCommerce team. Powered by WordPress. It is a fact that around 24% of the Internet is powered by WordPress. WooCommerce users can rest assured that they are using a familiar platform in online selling. Topping our list is shopping cart and eCommerce solution BigCommerce. This powerful tool helps companies set up and run their own online stores. It offers a vast number of customized templates to speed up online store design. The software comes with marketing tools that can help users expand their markets and customer bases. For physical products, BigCommerce offers shipping and delivery services so that users do not have to worry about these tedious processes. Other key functionalities include social media marketing, secure shopping cart creation, mobile optimization of storefronts and reporting and analytics, among others. Find out more about similar solutions in this BigCommerce alternatives guide. You can easily sign up for a BigCommerce free trial here. Aside from being an eCommerce platform, BigCommerce has other functionalities to offer. It can handle social media marketing, payment processing, SEO and warehouse management. Integration with your existing business systems is a breeze while an API capability lets the system work seamlessly with third-party applications. Your site visitors are sure to stay a bit longer as websites built using the tool are not only beautiful but engaging as well. This contributes a lot to customer engagement, which in turn leads to richer customer experience. It is likewise SEO-friendly and mobile-optimized, helping companies boost site traffic, search rankings and lead conversion rates. Often labeled as a complete eCommerce platform, BigCommerce is not limited to website building. it is feature-rich, offering capabilities such as marketplace integrations, site hosting, analytics, and marketing tools. Properly utilized, these features can help improve the performance of your organization. The solution likewise makes the checkout process fairly simple so that transaction data may be captured and used in measuring the performance of your organization. You are handed absolute control over all transactions with its central control panel while hastening the accommodation of orders. BigCommerce can be purchased in different pricing plans starting at $29.95/month. Why Use BigCommerce Instead of WooCommerce? It provides customers with rich shopping experience. It also functions as a sales channel hub. Why Use WooCommerce Instead of BigCommerce? It comes with highly-intuitive dashboards. It offers a wide variety of extensions. It is backed up by a community of contributors. Ranking second on our list of the top 10 alternatives to WooCommerce is website builder Wix. This popular cloud-based solution is designed to cater to both corporate and individual businesses. It is essentially a free service. But if you want to enjoy the benefits of its online store software to be able to sell online, you will need to subscribe to its premium plan. An appealing test drive of all software features is available to you when you sign up for a Wix free trial here. The software helps users build visually stunning and highly-customizable storefronts, which allow for order tracking and inventory management. Products can be displayed both by category or individually using product pages that can be designed to your preference. The system supports numerous payment methods, complies with international shipping rules, sets customized tax regulations and offers promos, special deals, and discounts. If you think that the software will not suit your needs, there other Wix alternatives out there. Why Use Wix Instead of WooCommerce? It is highly-intuitive and suits even novice users. It offers a wide array of visually pleasant templates. Why Use WooCommerce Instead of Wix? It has a library of extensions. It comes with full community support. Another ideal alternative to WooCommerce is eCommerce software Shopify. It is known for having all the functionalities and tools that are needed to build and operate your site and subsequently grow as an online seller. The system is ideal for online sellers who require solutions that are both mobile and accessible at all times. Users need not have that much technical know how when operating and maintaining their online stores as everything is handled by the vendor. With the solution, you are assured that your transactions are being hosted on secure servers that undergo regular updates. Building an online store is easy with the tool as it comes with pre-defined themes and an easy-to-use editor, allowing users to set up their branded online storefronts even without coding knowledge. For those who want to know more of these tools, check out this Shopify alternatives. Shopify can be purchased in different pricing models starting at $9/month. For those who want to test its features first, a free trial is also available. You can easily sign up for Shopify free trial here. Why Use Shopify Instead of BigCommerce? Its starting plan comes with eCommerce features and is affordable. Why Use WooCommerce instead of Shopify? It is an open source solution. It can build an online store out of any WordPress site. It is a free eCommerce plugin. An eCommerce solution designed to help businesses easily build and run their own online stores, 3dcart has all the needed features that can be used to boost their operations. It has existing partnerships with different providers, which include payment gateways, shipping carriers and tax calculators. 3dcart is highly scalable, easy to use and feature-laden, making it suitable for both small businesses and individuals who lack the skills to set up their online stores on their own. It also functions as a marketing tool, with its CRM, SEO and point-of-sale capabilities. If you are not convinced that the solution can provide your needs, there are other 3dcart alternatives that maybe right for you. 3dcart can be purchased in a variety of pricing models starting at $19/user per month. If you want to give it a try first, a free trial is also available. You can easily sign up for 3dcart free trial here. Why Use 3dcart Instead of BigCommerce? It offers tools for larger companies. It has an API to tailor it according to users’ needs. Why Use WooCommerce Instead of 3dcart? It is a free plugin. It is WordPress-based, making it a familiar platform. It comes with a vast array of add-ons. An eCommerce solution designed to cater to growing businesses, LemonStand offers vast customization options by offering access to its site codes. It is highly-scalable, able to keep up with changes in businesses. The software’s interface is known for its ease-of-use, allowing users to quickly create stunning websites. Perhaps the most notable feature of LemonStand is its ability to customize user experience, by allowing users to create online stores that reflect their brands. Just about every aspect of the online store can be customized–from product selection to checkout, eliminating customer confusion and therefore, improved conversions. It handles all critical aspects of online businesses, allowing users to focus on boosting sales. If you want to see more solutions of its kind, this LemonStand alternatives guide is just the thing for you. Lemonstand is available in different pricing plans starting at $19/month. If you want to test the software first, a free trial is also available. Why Use LemonStand Instead of WooCommerce? It can optimize checkout features. Why Use WooCommerce Instead of LemonStand? It comes with an intuitive dashboard. It is an open-source tool. Shopping cart solution Magento is an open source platform from online marketplace eBay. It has a myriad of tools and features that can give businesses the needed flexibility to effectively operate their online stores. This is possibly the reason for the platform’s popularity among businesses. With Magento, you likewise get to provide customers with richer online shopping experience. What’s good about the software is that it lets users customize the way they handle inventory and media content and even makes it possible to come up with a branded site for use in desktops and mobile devices. Magento comes with a vast selection of add-ons created by the Magento community. With the solution, users can offer discounts, recommendations and vouchers. Other prominent features include integration of shopping carts with payment gateways, stock and returns management and automated reminders, emails and newsletters. There other shopping cart tools that may interest you, read this Magento alternatives guide to find out more. Magento’s pricing details are not publicly disclosed. You will have to contact the vendor and ask for a quote. Why Use Magento Instead of WooCommerce? It has numerous tools to enrich shopping experience. It can segment customers for use in promotions. It offers SEO tools and robust security. Why Use WooCommerce Instead of Magento? It offers a highly-intuitive dashboard. It is basically a free plugin. Website builder Squarespace is a popular tool that is designed to help users create not only beautiful but highly-responsive websites. This capability is further reinforced by the features and integrations that come with the platform. The tool is intuitive and can be used by both small businesses and individuals who want to establish online selling presence, build their own sites or create a blog. The software has robust customization capabilities, thanks to its dynamic style editor that is simple to use. Website building is made easy as the product offers pre-defined templates, allowing users to quickly start the site building process. Web design is a breeze, with the system enabling users to navigate their sites even as they preview them. It has a vast selection of page elements that make website creation effortless. Perhaps what’s best about the tool is that it can be used for free, requiring users to enter but a name, email and a password. If you want to know more about similar tools, check out this Squarespace alternatives page. Why Use Squarespace Instead of WooCommerce? It is ideal for individuals and small businesses. It offers pre-built templates for website building. Why Use WooCommerce Instead of Squarespace? It has a wide selection of add-ons. It comes with robust support. It is powered by WordPress, making it a familiar solution. ECommerce solution Pinnacle Cart is a feature-rich and highly-customizable tool that offers add-on services, including development, customer support, and digital marketing, to name a few. It is feature-rich and comes with an easy to use interface and a wide array of templates. To make setup easier, the software comes with a quick-start guide to walk novices through the entire process. Pinnacle Cart supports multiple currencies and languages, making it ideal even for international businesses. Creating an online storefront with Pinnacle Cart is quite easy. All you have to do is choose a template, customize it to retain your brand and run it. All templates support mobile devices while users get to enjoy a Facebook store absolutely for free. Once your online store is up and running, product pages, orders, inventory and customer information can be readily viewed. You can add/edit products, set up shipping and manage orders and shipping, among many others. If you feel that you need to know more about software like this one, you can check out this Pinnacle Cart alternatives guide. Pinnacle Cart is being offered in three pricing plans starting at $44.95/month. If you want to take it for a spin first, a free trial is also available. Why Use Pinnacle Cart Instead of WooCommerce?  It supports digital product selling. It gives users total control over their online stores. It comes with marketing tools. Why Use WooCommerce Instead of Pinnacle Cart? It comes with a wide-array of add-ons. Open-source eCommerce software PrestaShop is an online store building solution that can be deployed via cloud or installed on-premise. It is popular among both large enterprises and entrepreneurs the world over. What’s good about the platform is that users get to enjoy robust support not only from the vendor but from a community made up of 800,000 members who are bent on constantly improving the software. Its key features include an intuitive interface, customizable themes, a powerful store builder, mobile optimization and designer guide. For those who want to widen their choices, this PrestaShop alternatives guide could be of help. PrestaShop can be used absolutely for free. All that is needed is to signup and your good to go. Why Use PrestaShop Instead of WooCommerce? It makes it easy to build online stores from scratch. The vendor offers comprehensive training materials. Integrates seamlessly with leading business systems. Why Use WooCommerce Instead of PrestaShop? It can be used to set up stores in any WordPress website. It has a large library of extensions. It can work with any WordPress-powered site. Web-based online store builder Ecwid is designed to aid individuals and businesses construct online stores from their existing websites. Unlike other tools in the category, Ecwid does not need to create new eCommerce sites. Using the software’s builder feature, you can create visually attractive online catalogs. It comes with numerous features such as credit card payment processing, shipping rate provision and photos management. What sets Ecwid apart from other solutions is that it is not an online store but a widget. What’s more is that it you can embed it not only on your site but also on social media business pages, blogs, mobile apps and marketplaces. Storefronts are also effectively synced, making them much easier to manage. Truly, Ecwid is the least expensive way to build and operate your very own online store. But if you want to know other solutions like this, this Ecwid alternatives guide will prove useful. Ecwid is available in different pricing plans starting at $15/month. For those who need only the app’s basic features, a free plan is also available. Why Use Ecwid Instead of WooCommerce? It can be embedded on social media, apps and marketplaces. It optimizes stores for all operating systems and devices. Why Use WooCommerce Instead of Ecwid? So there you have it, our top 10 alternatives to WooCommerce. By this time, you should be able to tell if the platform is right for you. Of course, BigCommerce is the top pick and rightly so. But if you feel that you need to know more about these tools, check out this shopping cart software comparison guide, which presents a comparative analysis of some of the most popular products in the market.